"She (the baby) was needed, and then there she was among us, growing and changing every day, a living little girl, one of us. At first, she was only present, enclosed mostly in her own small being. And then, we could see it happening, she began to look out of her eyes. She began to see the light from the windows. She began to see us. She began to know us. She began to look at us and smile, as if greeting us from a world we did not know or had forgotten." When you think about it, we in this world have so many more similarities than differences. One of them starts from each of our beginning, our source. We have all been on the same journey to arrive here on this earth. Each of us has been cradled in the same kind of dark, warm and watery cocoon. The unfamiliar jostling of our birth to this world, I am sure, abruptly awakened our senses. Initially, the new journey must be disorienting and uninviting. Hopefully, most of us are greeted warmly to our new light-filled home. 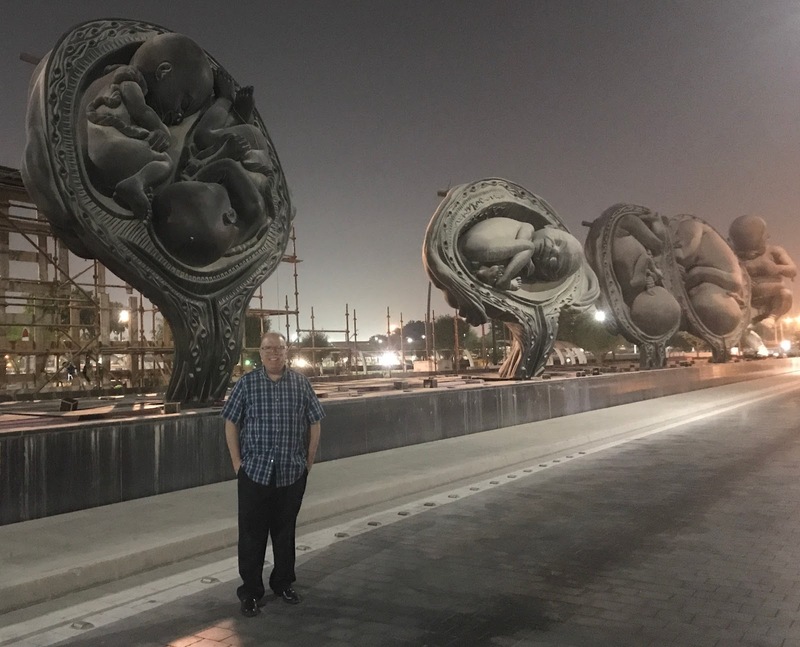 Each time I have gazed at the shimmering 14 bronze sculptures by the British artist, Damien Hirst, here in Doha, Qatar that is called "The Miraculous Journey," I am flooded with awe. This continuous journey, which humanity has been traveling on for eons of time fills me with a renewed reverence for the breath of life. Each of the 14 sculptures illustrates a turning point on the journey we have all passed. As you walk along the path by the sculptures, they spark you to remember our singular common journey--that we were meant to change and grow. They show you that being alive means we are constantly developing and being shaped--that life is a wonderful wonder. All of the 14 sculptures make up about 216 tons. When you are underneath them, you feel the magnitude of the scale and power of life. Furthermore, you sense the importance of how tremendously important every child/person is in this world. They came on "The Miraculous Journey" for a purpose all their own. And when we encounter all of these sojourners, we must remember the tenderness and goodness that each can bring to this world. As my husband says who has delivered about 20,000 babies, "Every child is a miracle. I never tire of bringing a child (sometimes two or three or four at a time) to this world. I enjoy it so much that I would do it all for free. The moment the child arrives, the room is filled with an unspeakable hope and happiness. And I feel like the luckiest person to be there in that room with all that joy. It is different every time, every family, each child. But the same joy is there. Every time." 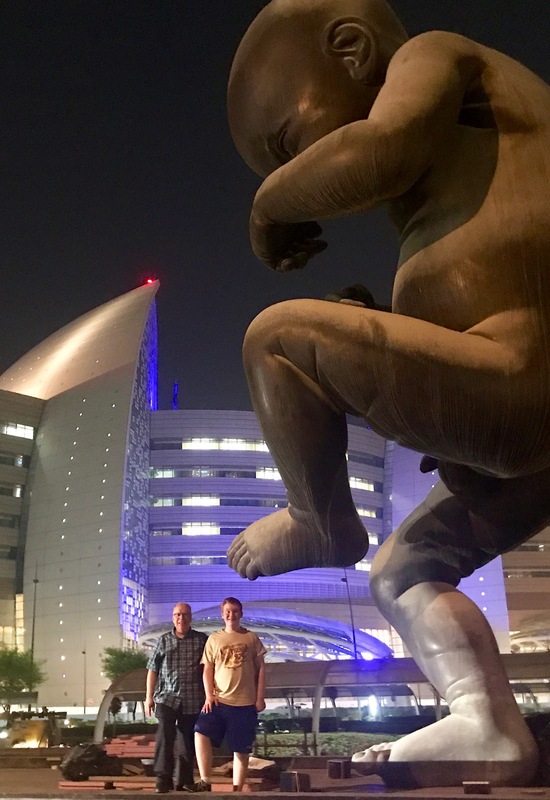 The end of the gestation journey--a baby boy who is almost 46 feet tall. The public sculptures in front of the new Sidra Women's and Children's Hospital that opened in January 2018. The first one in the series of the gestational beginning in the uterus. The splitting of the egg and then the division of the eggs. The top is called the morula, the early stage of an embryo consisting of sixteen cells. The first three sculptures in a line show before the embryo is formed. The fetus begins to form. The one may be my personal favorite. Do you see the smile on one of the twin's faces? My husband is a twin so he particularly liked this one too. Giving another perspective of the different stages of life. My husband wanted to stand in front of the twins since he has a twin sister. Sometimes people ask if they are identical. The answer is no. He says she is much better looking.